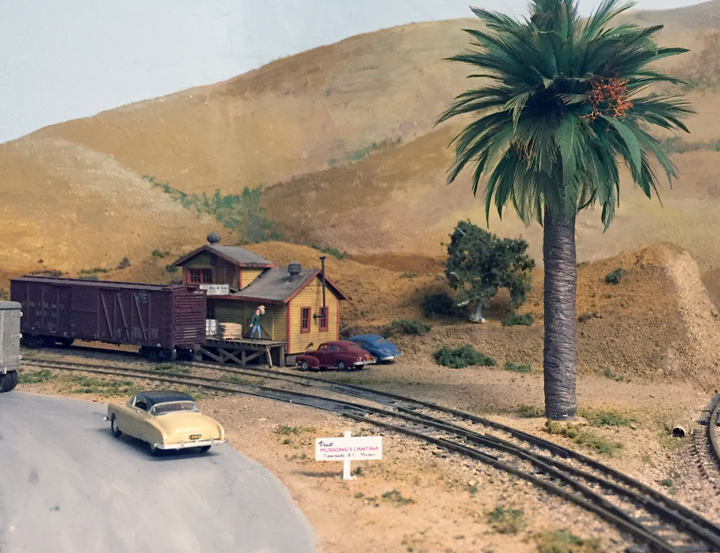 Thinking ahead to upcoming layout operating events, I am continuing to make small and large changes to improve my layout. (Starting with my version of “management by walking around,” as I described in an earlier post; it can be found at: http://modelingthesp.blogspot.com/2018/07/management-by-walking-around.html .) This post describes a few of them. I have an ongoing project to install Bitter Creek ground throws wherever feasible. I first mentioned these fine products in a post a few years ago (you can see it here: http://modelingthesp.blogspot.com/2012/09/electrical-wars-part-3-hand-throws.html ), and have continued to gradually replace the original Caboose Industries throws, most of them installed decades ago when the core of the layout was new. 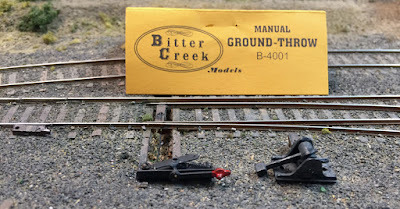 I prefer Bitter Creeks wherever appropriate, both because of the far smaller size and less obtrusive appearance, but also because of how well they perform (I’ve explored those aspects previously, in a post at this link: http://modelingthesp.blogspot.com/2017/03/choosing-ground-throws.html ). The replacement process continues, with the latest replacement on the ice track switch in Shumala on my layout. I included the Bitter Creek package label in the photo; you can see and purchase their products at this link: http://www.bittercreekmodels.com/page11.html . I placed the removed Caboose Industries monster alongside at right for comparison. Now to Hussong’s Cantina. I remember as a teenager in Southern California, seeing occasional roadside signs reading “Visit Hussong’s Cantina,” and stating its location as Ensenada, in Baja California, Mexico. One time during my teenage years, our family included a driving trip to Baja California as part of our beach vacation to Balboa, and I persuaded my dad not only to drive past Hussong’s, but to allow me to go inside. Today I know that Hussong’s is really a historical survival, founded in 1892 and still located in the same building, with about the same decor, in central Ensenada. And on the historical side, one of the contenders for the distinction of having invented the Margarita cocktail is a Hussong’s bartender, Juan Carlos Orozco, who invented it in 1941 at Hussong’s in honor of a visit by the German ambassador to Mexico and his daughter, Margarita Henkel. (Founder John Hussong was a native of Germany.) As there are a number of such claims for the origin of the Margarita, this one is only an additional curiosity. and here it is in place, alongside Pismo Dunes Road in East Shumala. It’s fairly unobtrusive but does add some regional color and history. 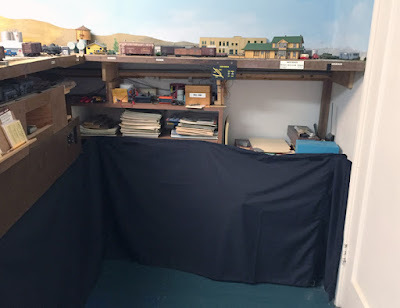 Last in this topic is the drapes under my layout fascia. I have long had a black cotton drape, sewn by my wife in several sections, and attached with Velcro. 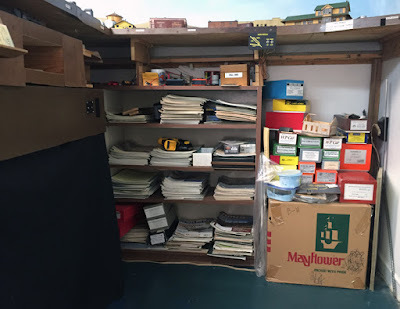 It was originally made for my layout in Pittsburgh, and since my current layout is smaller, I just used sections that approximately met the outline of my layout peninsula, but these sections did not allow me to connect the legs of the “T” to the sections along the wall, nor did they cover any of the bookcase which lines the wall. An example is shown below. Most of the piled boxes at right are empty boxes for brass models, and don’t have to be stored here; I left them in place to indicate the kind of appearance I want to hide. You can see the existing black drape under the fascia at left. Since I still had a number of now-unused black drape sections, the obvious answer was to attach some of the surplus material to the drape sections already in use. My wife did this task, including putting additional Velcro “loop” sections where I marked them to be needed. I then used thick-formula CA to glue the second or “hook” Velcro type to the bookshelves as appropriate. Here is the result for the area shown above (I also extended the drape on the other side of the layout). looking forward to trying these ground throws, but I went to their website and he claims they are out of stock. FYI. Yes, Burr, but it says TEMPORARILY out of stock, and also says that they should be available again soon. Keep looking!